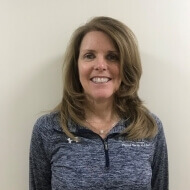 Kathleen has been a therapist in the Abington clinic since 2006 and is currently the Clinic Manager/Lead Physical Therapist. She graduated from Boston University with a Master’s Degree in Physical Therapy. She employs a wide variety of of treatment techniques, combining manual therapy, therapeutic exercise and a strong emphasis on patient education to allow patients to better understand their diagnosis, achieve their therapy goals and promote life long health and wellness. Kathleen is comfortable working with a varied patient population. Kathleen attended Institute of Orthopedic Manual Therapy, a year long post graduate residency program, enhancing her differential diagnosis skills, joint/spinal and soft tissue mobilization techniques and exercise concepts. She is also a certified LSVT BIG clinician, a treatment program specifically designed for patients with Parkinson’s Disease. Kathleen enjoys spending time with her family (both human and 4 legged) and is an active member of her community.